Uptown Greenwood seeks downtown residents - Greenwood Communities and Resorts, Inc.
Uptown Greenwood encompasses the Main Street square, the eastern side of the square to Phoenix Street and the western side of the square to Edgefield Avenue. The area is designated the Uptown Greenwood Special Tax District. It was created in 1984 and is comprised of approximately 13 city blocks and 57 acres of property. In the early 2000s, city leaders set Uptown Greenwood on a path of revitalization that Barrineau said continues today. Barrineau said the Greenwood City Master Plan in 2004 helped revitalize the Uptown area. “Since those early 2000s we have seen the number of hospitality venues grow tremendously. We’ve got the office settings; the Inn on the Square is thriving; we’ve got hospitality venues and great outdoor spaces where people can gather,” he said. “Now we are developing the living component. In 2006 the city council amended the zoning ordinance to allow second floor housing. We’ve had a vision for residential living for many years.”Tim Burke, owner and developer of 332 Main LLC, is developing the old textile building on Main Street. The 45,000-square-foot building was built in the early 1900s, has eight stories and once was the home of JCPenney. Barrineau said that when JCPenney left, a few industries still had corporate offices there, but then by 2003-04 “it was totally vacant and has been vacant for about the past decade,” he said. “It is now thriving. There are big sold signs in the windows where those are being turned into condominiums. Floor by floor it is being sold,” Barrineau said. Burke completely gutted the building, which now houses three retail shops on the first floor. He is developing six stories of the building into condominiums. The $4 million project will offer 15 finished or build-to-suit condos ranging in size from 1,800-square-feet to 1,915-square-feet, with the purchase price of each finished condo ranging from $250,000 to $298,000. Build-to-suit units may cost more, he said. In addition to developing the living component Uptown, Barrineau said the city is looking to connect the various “hubs” in the area that include the medical district, Lander, Westside community/neighborhood. 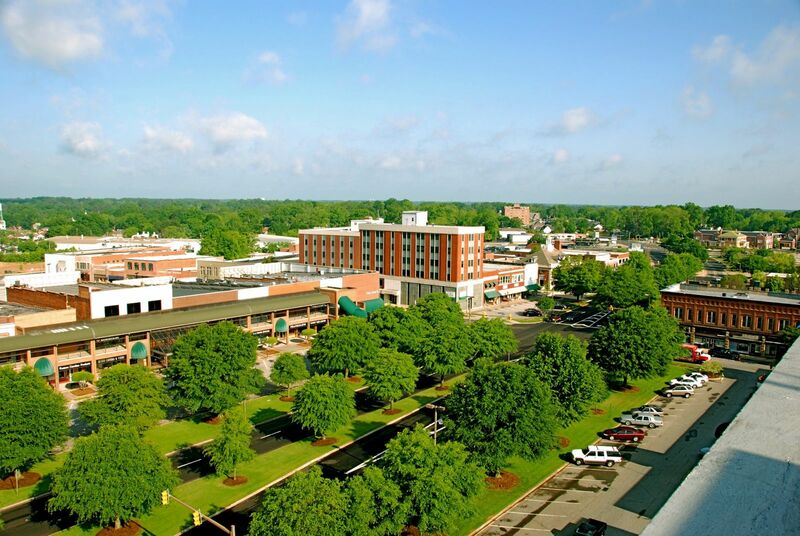 In 2012 the city created the South Main/Edgefield Corridor master plan, the major component of which is the construction the Carolina Avenue Connector, a road connecting South Main Street to the medical district that includes the Greenwood Genetics Center and Self Regional Healthcare. “We hope to build a connection with the road, with sidewalks and bike lanes,” Barrineau said of the Carolina Avenue Connector. Barrineau said unding consideration for the Carolina Avenue Connector Project will be included on a Nov. 8 Capital Project Sales Tax referendum to be considered by Greenwood County voters. The city also wants to better connect Lander University with Uptown so the student population can have easier access. The city also is partnering with the Westside community group to determine how to revitalize that neighborhood. The work includes a partnership with Greenwood Habitat for Humanity, which has been “strategically working through that area to renovate homeowner occupied homes, and also buying dilapidated, unlivable properties and working to get those removed with the hopes of creating a long term plan of new Habitat homes in that area,” Barrineau said. One of the many success stories to come out of the Uptown revitalization efforts is the Mill House, Barrineau said. Owner Gianpaolo “Geep” Bonaca purchased the building in 2008 to open a pizza restaurant, the Mill House. “He had so much success with that he purchased the next building and expanded the restaurant and created a brewery, Good Times Brewery,” Barrineau said. The continued success led to Bonaca purchasing a third building, which is now under renovation. “I guess the biggest line in the sand for Greenwood in the last four to five decades was the decline of the textile industry, which also created the decline with the railroad. Greenwood was a railroad hub,” Barrineau said. Once upon a time, Greenwood had five major railroad lines running through the city. One of those lines went through the middle of Uptown, on Main Street, “hence the phrase that Greenwood had the widest Main Street in the world,” Barrineau said. He added the train would sometimes stop in the middle of town, forcing the city to station a fire truck on one side of the square since the town had just one station. A plan was created in the 1970s to remove the railroad tracks and divert the trains around the square. Now the rail operations have no impact on city operations. There was also a vision for a hotel in the Uptown area in the 70s which resulted in the Inn on the Square in the early 1980s. Also, 60 laurel oak trees were planted along Main Street in 1985. The anchor project of the Greenwood City Master Plan, according to Barrineau, was the The Arts Center, located at 120 Main Street. “It was originally the first Greenwood post office that was constructed in the early 1900s. Later the federal government added to the building, added the federal courthouse onto the back,” Barrineau said. The federal government decommissioned the building in 2002. After that, Barrineau said the city and county took joint ownership of the building and worked with the Self Family Foundation to revitalize it into what it is now, a 25,000 square-foot center where art is showcased and fostered. An important component of developing any downtown, or Uptown, is to do things that create a unique draw that tie somehow to who you are as a community, according to Barrineau. “When you say Greenwood, most people who maybe haven’t been here or don’t know much about us will immediately think Park Seed, and so you think flowers,” he said. Barrineau said volunteers visited Epcot in Orlando, Fla. and watched the process of building and growing live topiaries so they could bring something like that to Greenwood and capitalize on being home to Park Seed. “In 2007 the community introduced its first 13 topiaries during the S.C. Festival of Flowers. Fast forward a decade, we now own and present 43 live topiaries on the square during the summer,” Barrineau said. The topiaries are on display throughout Uptown from mid-May through July. The topiaries include a variety of animals and characters, from an elephant to a giraffe to a gorilla, as well as a Tiger and a Gamecock. They are housed in a city-owned greenhouse where they are maintained throughout the year.